British comics on the UK news stand - where next? Last week, I was contacted by two newspapers, the Sunday Times and the Independent on Sunday, to offer my views on the state of the British comic industry. Specifically, comics on sale in UK newsagents. 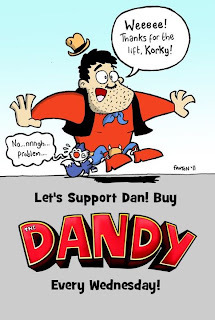 The requests were prompted by the disappointing ABC figures for The Dandy, which, as we previously reported, is now selling around 7,448 copies a week. The Sunday Times published its feature on 11th September - apparently, only in its Scottish edition - and the IoS will run its story later this month. If there's an online version of the ST feature, which was written by Marc Horne, it must be behind the newspaper's paywall, but Deadline News has pretty much lifted the entire piece for its site and published a similar article here ("Desperate Dandy: comic’s celebrity relaunch 'backfired'"), which includes some of my comments and those of Kid Robson, minus a response from Dandy artist and British comics expert Lew Stringer. 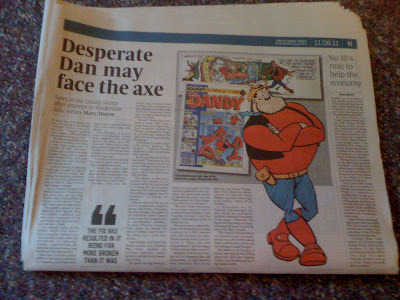 Commenting on the sales figures, a spokesperson for DC Thomson, who publish The Dandy described them as "disappointing. "There is no getting away from that," they acknowledged, but pointed to success elsewhere for their comics titles. 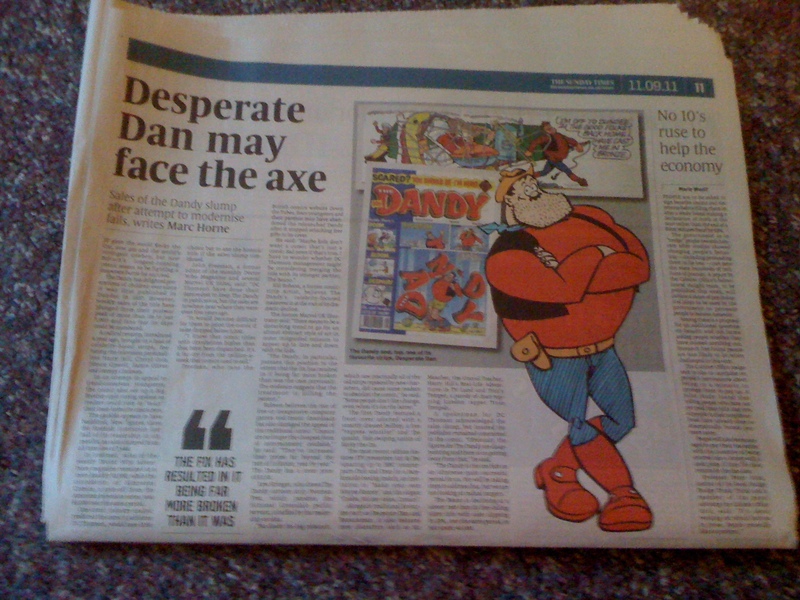 Needless to say, the coverage and subsequent online posts by Dandy artist and re-designer Jamie Smart in defence of the comic (here and here) have provoked some fierce debate - but in addition, a very measured and useful analysis of many of the problems besetting the British comics industry by Lew Stringer, in the wider context of declining magazine and newspaper sales. You can read that in full on his blog, but he rightly points to an overall decline in print sales of magazines and newspapers. (Despite print's decline, sales of news stand comics continues to be fairly robust and is not as bad as some other sectors). For me, the problems lie not in content per se - you would expect some people to like one comic and not another - but one of trying to reach an audience already swamped with a much higher brand awareness for other things that will attract their purchasing power. Our main problem, I feel, is that many people simply aren't aware of the range of comics out there on the news stand, because publishers cannot afford to promote them in the same way as can, for example, Microsoft when it comes to the XBox or Nike when it comes to shoes. It's an issue Lew Stringer remarks on, pointing out that until recent times (the 1980s, perhaps?) comics were pretty much the only provider of escapism. "Today, kids have a multitude of distractions," he notes. "TV, DVD's, games, mobile phones, the Internet, sports centres, and, very often, solvent parents who can afford to take them on trips at weekends. Flat pictures on paper must seem very primitive in comparison. The more distractions kids have had, the more sales of comics have fallen. Coincidence?" Personal initiatives to plug The Dandy (for example, by Dandy artist Andy Fanton with this fun graphic, left) all help get the message out, as, I hope, do web sites like downthetubes, Blimey! 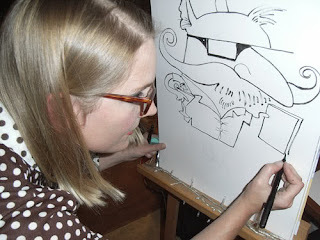 It's Another Blog About Comics, Comic Bits Online and Bear Alley. (The Forbidden Planet International blog and Bleeding Cool also deserve praise for their British comics coverage, but they also have a wider remit). 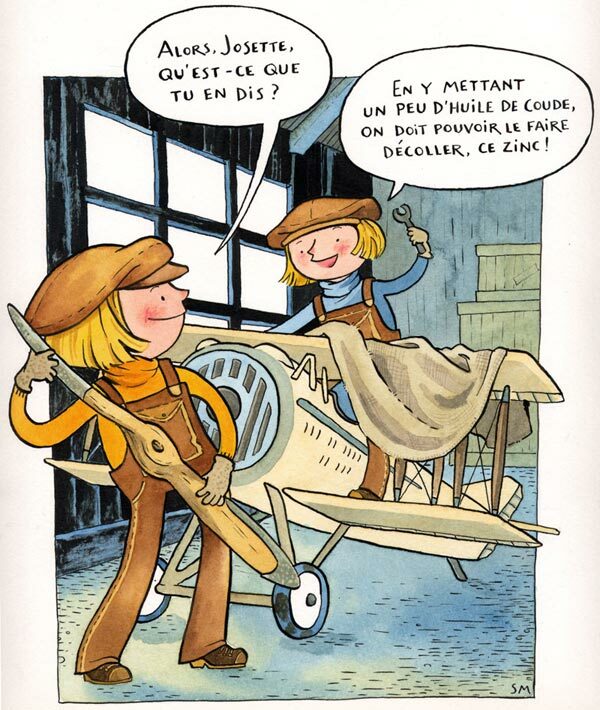 In a wider context, of course, comics are far from dead - you only have to key in "web comics" to see how alive and energetic the medium is, and the growing success of graphic novel sales in bookshops, aimed at all ages. But what's the future for the news stand comic? So, what do readers of downthetubes think? Is the British comic industry facing serious decline as far as the news stand is concerned? Are such things as digital publishing, high quality albums a way forward? Tube Surfing: Three-panel Comics, Interviews, Reviews, Birthday Greetings and Fan Art! • The Forbidden Planet International blog has really gone to town with their reviews of the DC Comics '52' re-boot (re-launch?) Here's a round-up of all their reviews for the first week of that 'event' (several of the titles are by Brit creators). • Ed Kaye interviews Rob Williams and D'Israeli for 2000 AD Online about the new series of Lowlife. Plus he also has a chat with Kek-W about his new series, Angel Zero. Ed seems to be that site's resident interviewer now and, I have to say, he's doing good work. 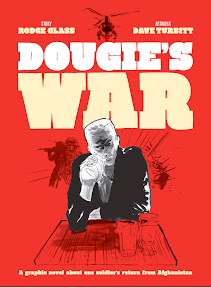 • Warren Ellis is hosting three-panel comic strips at his blog. Good to see him supporting other comic creators (as ever). • I hope I get a birthday card from and drawn by Jim Medway when I hit 40. • Paul Cornell directs us to a preview of his Demon Knights comic over at Wired. Sarah McIntyre does great event reports! And finally, I do like the readers' art page at Garen Ewing's website. For this week's Panel Borders show, in a panel discussion recorded at last month's Comics and Conflicts conference at the Imperial War Museum, London, Paul Gravett talks to Mikkel Sommer about his graphic novella Obsolete, to publisher Adrian Searle and artist Dave Turbitt about Dougie's War and to film maker David Blandy and illustrator Inko about their project Child of the Atom. The show is edited and introduced by Alex Fitch. • Panel Borders: Children of the Atom airs at 5.00pm, Thursday 15th September on Resonance 104.4 FM / streamed at www.resonancefm.com / extended 70min podcast at www.panelborders.wordpress.com after broadcast. 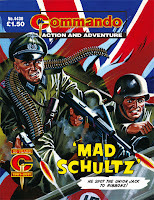 As other British comics titles struggle to survive with some, like CLiNT, reducing their frequency, Commando increased its frequency this year from eight issues a month to four every two weeks. 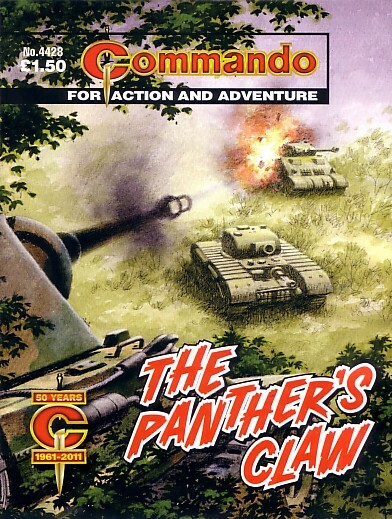 This means there are now 104 Commandos published in a year instead of the previous 96 or, to put it another way, the Commando team produce the equivalent of one brand new 63 page story, plus they reprint another from the original artwork in their archive, every week of the year. 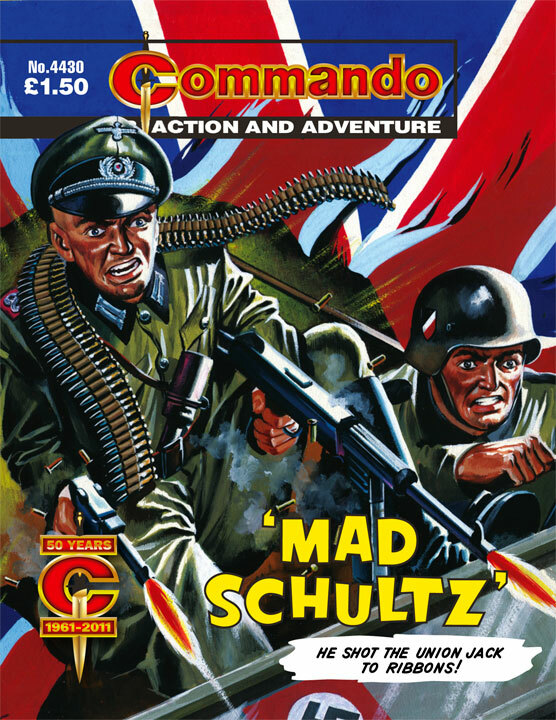 Due to the way the publishing dates fall in September, this means that instead of eight Commandos being published this month there will be twelve, including the ongoing reprints of the first ten issues of Commando that were published back in 1961. 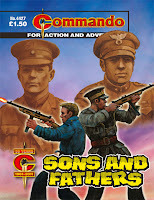 Our thanks to editor Calum Laird for all the gen on the latest batch of Commandos to hit the shops. There they stood, back-to-back, Beretta sub-machine guns stuttering as they fought for their lives. It had been the same many years before as their fathers had battled shoulder-to-shoulder in a heroic but doomed last stand. Would history repeat itself? Or was there another twist to the tale? Out of nowhere they appeared, miles behind the front line, falling on undefended convoys like wolves on a flock of sheep. Machine-guns blazed, trucks were blasted to pieces, and men fell in roadside ditches. Then they were gone as swiftly as they come, and yet another British supply column was left a smoking ruin. They were German guerrilla fighters, trained killers every one, and they were led by a man as fearless and cunning as any. Captain Schultz was his name — special Nazi commando. Soon the question was on every British soldier’s lips…where will Mad Schultz strike next? DC Thomson's official Commando website has recently added a lot of content inspired by the Draw Your Weapons exhibition of Commando artwork at the National Army Museum in Chelsea. The entire section of the website is indexed here and, while all of it is worth a read, there are a few sections worthy of a special mention in dispatches. There is an impressive three part illustrated history of British adventure papers/comics from Boy's Own in 1855, via The Magnet and The Gem to the present concentrating, of course, on DCT's own boys titles. The series of articles begins here. In addition to this history, which mentions the DCT WWII pilot character Matt Braddock VC who appeared in various DCT titles including Rover, Victor and Warlord, the website has included the entire first chapter of the I Flew With Braddock novel that was published in 1959. This novel reprints the weekly Braddock text stories from The Rover and is effectively the story paper equivalent of the modern day graphic novels that reprint the weekly stories of 2000AD or Battle. The first chapter of the novel can be read here. 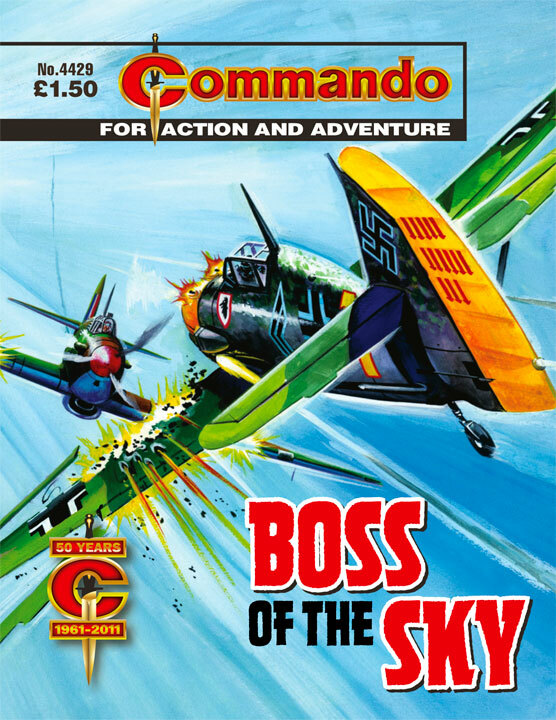 Complementing the pictures elsewhere, ten different Commando issues are focused on with credits, cover illustrations and comments on each from Commando editor Calum Laird and former editor George Low. These covers begin here. 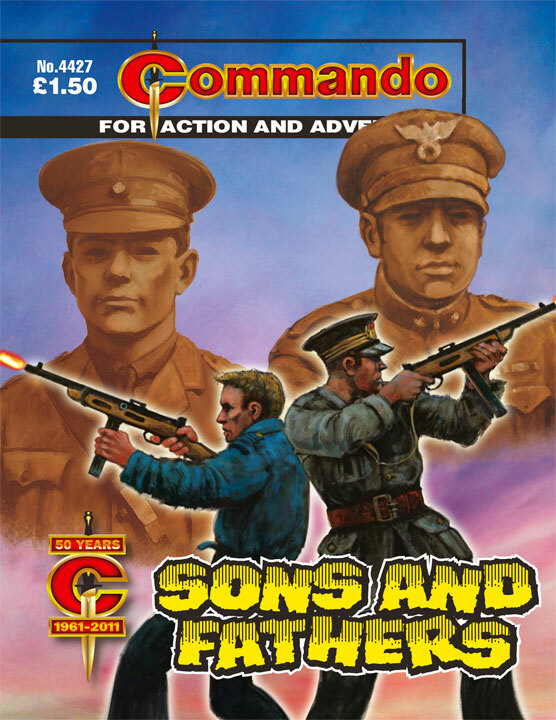 To promote the Nation Army Museum exhibition, cover artist Ian Kennedy produced a new illustration, shown above, for the museum's poster in the style of a Commando cover. This artwork is available to download as a PC wallpaper. Finally there is a video interview featuring current and former editors, Calum Laird and George Low, and deputy editor Scott Montgomery talking to cover artist Ian Kennedy about his work on Commando covers. This is a rare opportunity to hear one of the greatest living British comics artists talking about his work. 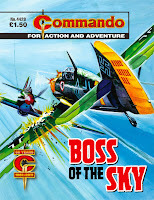 There are more details of Commando on the official Commando website. There are more details of the Draw Your Weapons exhibition at the National Army Museum website. MCM Expo London Comic Con is expanding its Comic Village area after tables for the 28-30 October show sold out in record time. Due to the massive demand, the Comic Village will now be enlarged by 50 per cent to give even more comic creators the chance to attend the UK’s biggest pop culture event. Rainey launches 'Thunder Brother; Soap Division"
Some of you might have been wondering what talented comic creator Paul B. Rainey has been up to since finishing his highly-acclaimed There’s No Time Like The Present last year. Well now we know: its successor, Thunder Brother; Soap Division. "I don’t want to tell you too much about it for fear of giving too much away about the opening story," says Paul, "but I do want to tell you that I will be uploading a page from the strip every Monday and Friday at http://thunderbrother-soapdivision.blogspot.com/. 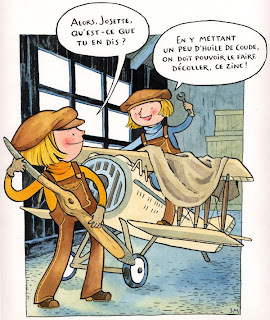 "Each page is in full colour (yum!) and free to read (double yum!!)!" Cartoonist, illustrator and Panic Coordinator to Breakfast television since 1992, Paul Rainey is the creator of online hit diary comic strip Book of Lists, a full colour book collection of which is now available. His graphic novel There's No Time Like The Present will be published during 2012. "Thunder Brother; Soap Division is an all-ages strip," says Paul, "so feel free to mention it to your children, younger brothers and sisters, parents, neighbours, anybody that you might bump into in the Post Office and that grumpy man who serves behind the counter in your local shop. "Alternatively, tell your Twitter followers, website visitors and Facebook friends." (With thanks to Paul Gravett): Britain is the guest country at this year's Helsinki Comics Festival , which takes place this coming weekend. As part of this, Comica Festival is originating an exhibition 'Great British Comics Nows' spotlighting the festival's guests - Bryan & Mary Talbot and Warren Pleece - as well as other contemporary UK creators. The exhibition is curated and designed by Paul Gravett and Peter Stanbury, co-authors of Great British Comics, and will be touring to other international comics festivals, starting in November at Comica Festival in London and then in December at Strip Turnhout in Turnhout, Belgium, with the support of the British Council. Adam Brockbank (MeZolith), Darryl Cunningham (Psychiatric Tales), Hunt Emerson (Ancient Mariner), Garen Ewing (The Rainbow Orchid), Paul Grist (Jack Staff), Dave McKean (The Savage), Jon McNaught (Pebble Island), Kevin O'Neill (League of Extraordinary Gentlemen), Luke Pearson (Hildafolk), Woodrow Phoenix (Horse Drawn), Warren Pleece (The Great Unwashed), Frank Quitely (We3), Paul Rainey (There's No Time Life The Present), Posy Simmonds (Gemma Bovery), Bryan Talbot (Grandville), and Mary Talbot (Dotter of Her Father's Eyes). As well as a programme of individual presentations and interviews and a group panel discussion including the invited guests and Sam Arthur from Nobrow, the Grant Morrison documentary film 'Talking with Gods', directed by Patrick Meaney, will have its Finnish premiere. 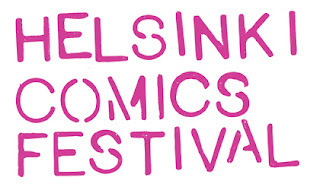 The 26th Helsinki Comics Festival will take place on the 16th - 18th of September 2011 and is the largest comic-related event in Finland and Northern Europe, organised by the Finnish Comics Society since 1979. Along with British comics, this year's special themes are World Comics and 100 years of Finnish comics. The festival programme includes lectures, discussions, workshops, interviews, performances, competitions, signings and evening events. A large variety of Finnish and international comics exhibitions are included again at this year's festival. Several galleries and institutions are working together with the festival to create exhibitions. The festival - which attracted some 15,000 visitors last year - has a comic fair for publishers and commerce from Finland and abroad. This will be arranged for the second year in a large scale tent at Lasipalatsi square at the heart of the Helsinki. The event is free and public and includes a Small Press Heaven, an alternative fair of zines, smaller publications and young artists at a separate spot near the main tent. Richard Bruton of the Forbidden Planet International blog has posted a preview of Will Kirkby's magnificent looking Tuk Tuk comic. See it here. Also at that blog, there's the third and final in a series of reports on the Birmingham Comicon, this time written by Michael Gee of Nostalgia and Comics. Meanwhile, ace small press news-log Bugpowder makes us aware that Rob Jackson's Flying Leaf Creature is out. According to the site, "Rob Jackson's trademark blend of absurdist, child-like whimsy, sweet-humoured tone and disarmingly naive cartooning (shades of Mr.Benn here) is present in this full-colour tabloid-format comic." Cartoonist, illustrator and writer Sarah McIntyre provides a report and photos from the Klimb Children's Book Illustration Auction, which saw her and other artists doodling for charity. Writer Tony Lee reports on the Orbital Comics Midnight Extravaganza, a midnight opening at that well-known London-based comics shop to celebrate the launch of DC's new line-wide reboot of its characters and titles. Novelist, comics scriptwriter, beat activist, artist, agitator, DJ, sushi expert and sonic assassin Al Ewing writes about some of those rebooted DC comics over at the Travelling Man blog. Ace artist D'Israeli reveals why he'll never be rich at his blog. And finally, I'm really digging this new blog devoted to science fiction comic 2000 AD's Future Shocks.